Alan Moore has been interested in magic as a subject for stories ever since he was a child. He was put off on the subject due to the type of people that gravitated to the subject in the occult shops of the 70's. People who did not have much going on in their lives and tried to fill the gap with some sort of pretense of secret knowledge or special powers. According to Alan Moore, John Dee is the genius responsible for the rise of British sea power and the British Empire. He wrote books about mathematics that laid the foundations for Newton's later work. 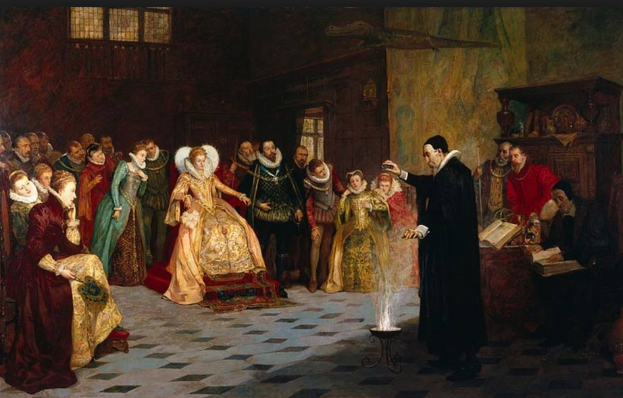 John Dee provided Queen Elizabeth with the justification for claiming North America as British territory. He did this by finding references in ancient texts regarding Welsh legend, Prince Madoc, traveling across the sea and discovering a new land world before the Portuguese/Spanish. John posited that, since the British has discovered it first that Queen Elizabeth could claim is as part of what Dees termed, the "British Empire." History Channel - Welsh legend indicates that Prince Madoc sailed to America in 1150 A.D., but can science prove the theory. John Dees believed that his scrier, Edward Kelly, was passing on visions and precise instructions from entities that he called "Angels." Alan Moore was unwilling to totally dismiss this concept since it was coming from such an eminent person so he decided to look more into magic. He changed his life around to start looking at this stuff on what he hoped was a rational level, something that at least made sense to him. Alan had a couple of experiences that convinced him that there was something to this. Reaching the magical state is something that humans have been attempting to get into via a variety of methods since we lived in caves. Repetitive ritual drumming is one way to get into this trance state. Various forms of meditation is another. Some people have used sexual techniques and a lot of people have used drugs, primarily psychedelic drugs. There are also a variety of other things like music and dance that people. Other ways include writing and creative art to move your head to different space. This is where magic happens. It only happens in your head. We are conditioned to think of things that happen in our heads as not being real, whereas it is real. There is a confusion because we live in two worlds at once but we think we live in only one. We live in the physical world where there are chairs and we live in the world of thoughts where there are ideas of chairs. We often think that the physical world is most important but often it is the world of ideas that is more important. For example, if every chair magically disappeared from the face of the planet, as long as we retained the idea of a chair, we would still have a place to sit down. That landscape of consciousness is a world and magic is a different way of engaging in that world. Magic happens in this world, the realm of ideas. Alan Moore accidentally encountered a demon in his head. You can have very strange experiences which is what magic is trying to describe. He was in a trance like state required to perform certain types of magic when he was assaulted by various unpleasant ideas that did not seem to originate from within himself. On the night in question, he was attempting a magical ritual in a halfhearted way with a group of people and it did not go well. He left angry since the others were not taking it seriously He went upstairs was attacked by waves of self loathing and doubt. He started feeling that he was a pathetic specimen for falling for magical shams. He felt that these feeling were coming from outside himself that he he was being psychologically attacked by a palpable entity, a demon. He was in a fierce struggle and was trying to get rid of whatever it was that was attacking him. He realized that he would have to do this physically even though it was not tangible. He had an initial moment of terror. He realized that the way to deal with this was to act sternly, His studied showed him that the way to deal with demons was with sternness. He tried to push this thing out of his reality. He could see a pattern of red and green lights. He pushed and it wound round his hands like fork to a place of warm spaghetti (his sensation) and with tremendous physical effort pushed this thing away. This seemed to work. The atmosphere lifted. His girlfriend notice the immediate lifting of mood. He also asked his friends who were staying over and they noticed too. Moore: You are fine and mysterious creature. What might you be exactly? Demon: I am one of the nine dukes. Moore: Which one are you? Demon: You'll have to guess. Moore: Are you one of the ones that begins with "B?" Is it you, Belial? Moore: Is it you Beelzibub? At this point Moore saw an infinite wall made of pink grey hog flesh with white bristles jutting from it studded from end to end with glaring hate filled eyes. It was the most horrific thing that Moore had ever seen. Alan realized that this was also not who he was communicating with and that, perhaps, he was on the wrong track and decided to try the letter "A." Moore: Is it you Asmodai? Hidden between the old and new testaments in some bibles is the Apocrypha. One of the books in the Apocrypha is the book of Tobit, which mentions the demon Asmodai, more commonly know by its Roman name Asmodeus. The Asmodeus of the Book of Tobit is attracted by Sarah, Raguel's daughter, and is not willing to let any husband possess her (Tobit, vi. 13); hence he slays seven successive husbands on their wedding-nights. When the young Tobias is about to marry her, Asmodeus purposes the same fate for him; but Tobias is enabled, through the counsels of his attendant angel Raphael, to render him innocuous. By placing a fish's heart and liver on red-hot cinders, Tobias produces a smoky vapor which causes the demon to flee to Egypt, where Raphael binds him (viii. 2, 3). Asmodeus would thus seem to be a demon characterized by carnal desire; but he is also described as an evil spirit in general: 'Ασμοδαίος τὸ πονηρὸν δαιμόνιον or τõ δαιμόνιον πονηρόν, and πνεῦμα ἀκάϑαρτον (iii. 8, 17; vi. 13; viii. 3). It is possible, moreover, that the statement (vi. 14), "Asmodeus loved Sarah," implies that he was attracted not by women in general, but by Sarah only. It is a show off. It is good at handicrafts. One must ask his name before he talks to you. Moore believes that Asmodeus took him on such a flight during their conversation when he asked Asmodeus to reveal himself. 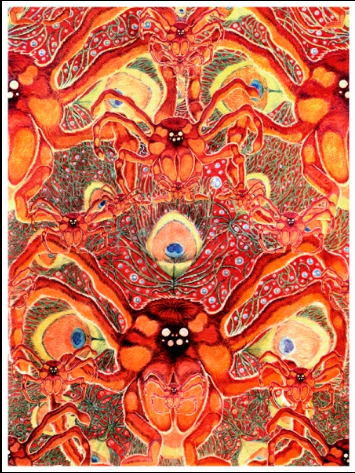 Asmodeus appeared a wall of variously proportioned spiders with peacock feathers interspersed. To the left is a picture of what Moore thought he saw in his head. When Moore was later working on a graphic novel on the 4th dimension, he came across the work of Tony Robbin. Robbin described the appearance of 4th dimensional being similar to how Asmodeus appeared to him. This led Moore to believe that Asmodeus was fourth dimensional and that his flight ability was simply the demon giving people 4th dimensional sight that allowed them to pear into others houses.